At the turn of the eighteenth to the nineteenth century, composers of piano concertos exploited the paradigms laid down by Haydn and Mozart. Jan Ladislav Dussek (1760-1812) composed almost twenty concertos over a thirty-year span, the earliest of these largely mirroring the formal plans of his illustrious predecessors, while several later efforts reflect and manifest new directions and priorities. This second instalment of Dussek’s piano concertos offers a further trio of examples from different points in his career: one of his earliest efforts (Op 3 in E flat major, published in 1787), another from a few years later (Op 14 in F major, from around 1791), and finally Dussek’s solitary effort in the minor mode (Op 49 in G minor, published in 1801). Born in Čáslav, Bohemia (now the Czech Republic), Dussek left home before the age of twenty, migrating via northern Europe to St Petersburg, and subsequently becoming Kapellmeister to Prince Radziwill in Lithuania. In 1784, he began a long, itinerant concert tour, arriving in Paris two years later, where he remained until 1789. Fleeing the French Revolution, he spent the next decade in London, before returning to his Bohemian home at the turn of the century. In 1804, he became Kapellmeister to the Prussian Prince Louis Ferdinand, then returned to Paris two years later, where he remained until his death in 1812. Dussek’s concertos (his only orchestral works) are mostly cast in the standard three movements. The first movements fall into the so-called ‘double exposition’ concerto form codified by Mozart at the end of the eighteenth century. This is typically followed by a lyrical slow movement (usually in a ternary design) in a closely related key, and capped by a rousing rondo in the key of the first movement. As one might expect, they make ever-increasing virtuosic demands on the soloist. One of the most salient features of Dussek’s later concertos is the absence of the cadenza, which Mozart had considered one of the staples of the form. 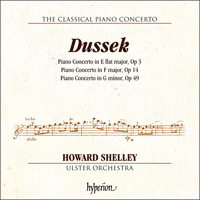 Dussek dispensed with this traditional gesture quite early in his career: the latest to include one is the Op 14 concerto featured on this recording, from around 1791. He seems to have been the first important composer to omit the cadenza, although most others would later follow suit. The Piano Concerto in E flat major, Op 3, is light in character and manifests a classical conception of the form, in line with the Mozartian paradigm of its time. In the first movement of Op 3 there is no harmonic digression after the secondary theme, and the thematic material of the exposition is used exclusively throughout. However, more progressive design elements include Dussek’s rather abrupt, Haydnesque shift from G major to A flat major in the development section, the omission of a recapitulation of the primary thematic material, and the lack of a cadenza. The second movement is a lovely ternary setting in the relative minor contrasted in selected places by forceful unison writing between the strings and piano, not unlike passages in Mozart’s D minor concerto, K466, composed a couple of years before the publication of Dussek’s Op 3 in 1787. A contrasting section in the parallel major (C major) follows, capped by a return to the original minor mode. As per usual, a rousing, Haydn-tinged rondo in E flat major closes the concerto with much passing of thematic material back and forth between the soloist and tutti, and several ‘false reprises’ in various distant keys. Composed approximately four years later, around 1791 (the year of Mozart’s death), the more expansive Piano Concerto in F major, Op 14, shows considerable growth on the part of the composer. While it is equally in line with Mozart’s model of the concerto, its design is more self-assured, revealing fewer ‘seams’ in the formal outline than his earlier work. Thematic inspiration seems stronger, and the harmonic digression within the transition section of the first movement, coupled with the introduction of new thematic material in the development, is indicative of a more progressive approach. This assurance is also evident in the greater scale of the movement, which at almost thirteen minutes is nearly half as long again as the corresponding opening of the Op 3 concerto, and features masterful concertante scoring for the winds, brass, and strings in turn. Virtuosity meets harmonic innovation in the ‘multiple approach’ to the big second tutti, where the solo piano’s semiquaver passagework leads to trills over the local dominant, preparing the ground to cadence in the new key of C major (in a very similar manner to the corresponding section in the Op 3 concerto), before the entire cadential passage is repeated to increase the tension and expectation. The second movement of Op 14 is a beautiful pastoral adagio in B flat major, with fetching pizzicato strings accompanying the piano. This movement is capped by a marvellous improvised cadenza of Shelley’s own devising (the only one on this recording). The concerto closes with a highly virtuosic rondo finale. 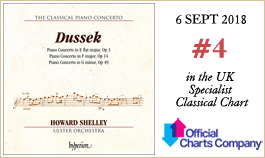 As if to announce the beginning of a new era in his approach to the composition of a concerto, Dussek’s Piano Concerto in G minor, Op 49, his first in the nineteenth century, differs strikingly from its predecessors in his oeuvre. Published as Op 49 (and, by virtue of Dussek selling the same piece to multiple publishers, also as Op 50), it dates from 1801, around the same time as Beethoven’s first three piano concertos. It is his only concerto in the minor mode, and reflects a darker and more romantically oriented mood, sombre and filled with gravitas where in the previous two concertos presented here classical lightness and gaiety prevail. The second movement is an E flat major adagio, and the third the obligatory rondo, cast, like the first movement, in G minor. Subtle and interesting formal innovations abound in the first movement of Op 49, especially regarding the treatment of themes. The first ritornello uses its primary theme for both the secondary (in the relative major) and closing (back in the tonic) themes, as well as the initial theme of the second and third ritornellos. The soloist offers a completely fresh trinity of themes (primary, secondary, and closing), each of which returns in the tonic in the recapitulation. The orchestra’s primary theme is never uttered by the soloist, and vice versa. This disposition of themes goes one step beyond Dussek’s usual thematic treatment, which allows separate primary, transition, and closing themes for the orchestra and soloist, but with a shared second theme. In the G minor concerto, Dussek seems to define a totally discrete, isolated world for the soloist, far removed from that of the orchestra. The development contains elaborate harmonic sequential patterns, unlike the development of any previous Dussek concerto. It would seem that subsequent romantic composers—Mendelssohn, Chopin, Schumann, Wieck, Liszt, and many others—were paying attention, as their later concertos would eventually manifest many of these qualities. The gorgeous second movement, in E flat major, begins with a wonderfully scored tutti which features octave French horn doublings. The fantastic dissonant sonority near the final cadence tinges the lovely conclusion with an element of pathos. The concluding rondo has an alla Turca (or alla Hongroise) sort of feel, with a jaunty, rhythmic lilt. The rhythmic energy is counterbalanced by the darker tonality, as Dussek writes in the minor mode throughout, a daring departure from his previous minor-key slow movements which marks a further harmonic innovation for the new century. It nonetheless rounds off the concerto with marvellous, inventive scoring, whimsical detours, and a very satisfying conclusion. À la fin du XVIIIe siècle et au début du XIXe siècle, les compositeurs de concertos pour piano exploitaient les paradigmes établis par Haydn et Mozart. Jan Ladislav Dussek (1760-1812) composa presque une vingtaine de concertos sur une période de trente ans, les plus anciens reflétant largement les plans formels de ses illustres prédécesseurs, alors que plusieurs œuvres ultérieures illustrent et proposent de nouvelles orientations et priorités. Ce second volume de concertos pour piano de Dussek offre trois nouveaux exemples issus de différentes périodes de sa carrière: l’un de ses premiers essais (op.3 en mi bémol majeur, publié en 1787), un autre, postérieur de quelques années (op.14 en fa majeur, composé vers 1791), et pour finir l’unique tentative de Dussek dans le mode mineur (op.49 en sol mineur, publié en 1801). Né à Čáslav, en Bohême (aujourd’hui la République tchèque), Dussek quitta sa ville natale avant l’âge de vingt ans; il émigra à Saint-Pétersbourg, via le Nord de l’Europe, puis devint Kapellmeister du Prince Radziwill en Lituanie. En 1784, il entama une longue tournée itinérante de concerts; deux ans plus tard, il arriva à Paris où il resta jusqu’en 1789. Fuyant la Révolution française, il passa les dix années suivantes à Londres, avant de retourner dans sa Bohême natale au tournant du siècle. En 1804, il devint Kapellmeister du prince Louis Ferdinand de Prusse, puis retourna à Paris deux ans plus tard et y resta jusqu’à sa mort en 1812. Les concertos de Dussek (ses seules œuvres pour orchestre) sont tous moulés dans les trois mouvements habituels. Les premiers mouvements relèvent de la forme concerto dite à «double exposition» établie par Mozart à la fin du XVIIIe siècle. Ils sont suivis de manière typique d’un mouvement lent lyrique (généralement de plan ternaire) dans une tonalité voisine, le tout étant couronné par un rondo exaltant dans la tonalité du premier mouvement. Comme on pourrait s’y attendre, le soliste est soumis à des impératifs toujours croissants en matière de virtuosité. L’un des aspects les plus fondamentaux des derniers concertos de Dussek est l’absence de cadence, que Mozart considérait comme l’un des principaux éléments de cette forme. Dussek se passa de ce geste traditionnel très tôt dans sa carrière: la dernière figurant dans l’op.14, écrit vers 1791, enregistré ici. Il semble avoir été le premier compositeur important à omettre la cadence, mais la plupart des autres allaient ensuite en faire autant. De caractère léger, le Concerto pour piano en mi bémol majeur, op.3, présente une conception classique de la forme, en accord avec le paradigme mozartien de l’époque. Dans le premier mouvement de l’op.3, il n’y a pas de digression harmonique après le thème secondaire, et le matériel thématique de l’exposition est utilisé exclusivement du début à la fin. Toutefois, parmi les éléments de conception plus avancée, on trouve un passage assez abrupte de sol majeur à la bémol majeur à la manière de Haydn dans le développement, l’omission d’une réexposition du principal matériel thématique et l’absence de cadence. Le deuxième mouvement est un bel édifice ternaire au relatif mineur contrasté en certains endroits par une écriture énergique à l’unisson entre les cordes et le piano, qui s’apparente à des passages du concerto en ré mineur, K466, de Mozart composé deux années avant la publication de l’op.3 de Dussek en 1787. Vient ensuite une section contrastée dans la tonalité parallèle majeure (ut majeur), couronnée par un retour au mode mineur original. Comme d’habitude, un rondo en mi bémol majeur entraînant teinté de Haydn conclut ce concerto avec beaucoup de va-et-vient du matériel thématique entre le soliste et les tutti, et plusieurs «fausses reprises» dans diverses tonalités éloignées. Composé environ quatre ans plus tard, vers 1791 (l’année de la mort de Mozart), le Concerto pour piano en fa majeur, op.14, plus grandiose, montre une évolution considérable de la part du compositeur. Même s’il s’inscrit aussi dans la ligne du modèle de concerto mozartien, sa conception fait preuve de beaucoup d’assurance, révélant moins de «ficelles» sur le plan formel que son prédécesseur. L’inspiration thématique semble plus forte, et la digression harmonique au sein de la transition du premier mouvement, liée à l’introduction de nouveau matériel thématique dans le développement, est révélatrice d’une approche plus novatrice. Cette assurance est tout aussi évidente dans l’ampleur plus importante du mouvement qui, avec ses treize minutes ou presque est à peu près une fois et demie plus long que le début correspondant du concerto op.3, dans une écriture concertante magistrale tour à tour pour les bois, les cuivres et les cordes. La virtuosité rejoint l’innovation harmonique dans «l’approche multiple» du grand second tutti, où les traits de doubles croches du piano solo mènent à des trilles sur la dominante du moment, balisant le terrain pour la cadence dans la nouvelle tonalité d’ut majeur (d’une manière très semblable à celle de la section homologue du concerto op.3); l’ensemble du passage cadentiel est ensuite repris pour augmenter la tension et l’attente. Le deuxième mouvement de l’op.14 est un magnifique adagio pastoral en si bémol majeur, avec de ravissantes cordes pizzicato qui accompagnent le piano. Ce mouvement est couronné d’une merveilleuse cadence improvisée par Shelley (la seule cadence que l’on entendra dans cet enregistrement des trois concertos). Ce concerto s’achève sur un finale rondo très virtuose. Comme pour annoncer le début d’une nouvelle ère dans l’approche de la composition en matière de concerto, le Concerto pour piano en sol mineur, op.49, le premier essai de Dussek dans le genre au XIXe siècle, diffère de façon saisissante de celui de ses prédécesseurs. Publié sous l’op.49 (et sous l’op.50, astuce lui permettant de vendre le même morceau à de multiples éditeurs), il date de 1801, à peu près contemporain des trois premiers concertos pour piano de Beethoven. Il s’agit de son seul et unique concerto dans le mode mineur et il reflète une atmosphère plus noire et plus romantique, sombre et pleine de gravité alors que dans les deux concertos précédents enregistrés ici la légèreté classique et la gaieté prédominent. Le deuxième mouvement est un adagio en mi bémol majeur et le troisième le rondo de rigueur, coulé, comme le premier mouvement, en sol mineur. Les innovations formelles subtiles et intéressantes abondent dans le premier mouvement de l’op.49, surtout en ce qui concerne le traitement des thèmes. La première ritournelle utilise son thème principal pour le thème secondaire (au relatif majeur) comme pour le thème final (de retour à la tonique), ainsi que le thème initial des deuxième et troisième ritournelles. Le soliste offre une trinité totalement nouvelle de thèmes (principal, secondaire et conclusif), qui retournent tous à la tonique dans la réexposition. Le thème principal de l’orchestre n’est jamais joué par le soliste et inversement. Cette disposition des thèmes va au-delà du traitement thématique habituel de Dussek, par lequel les thèmes principaux, de transition et conclusifs soient ainsi différents à l’orchestre et à la partie soliste, mais le deuxième thème soit partagé. Dans le concerto en sol mineur, Dussek semble définir un univers totalement à part et isolé pour le soliste, très éloigné de celui de l’orchestre. Le développement contient des schémas séquentiels harmoniques élaborés, contrairement au développement de tous les concertos antérieurs de Dussek. Il semblerait que des compositeurs romantiques postérieurs—Mendelssohn, Chopin, Schumann, Wieck, Liszt et bien d’autres—y aient prêté attention, car leurs futurs concertos allaient finir par présenter plusieurs de ces caractéristiques. Le superbe deuxième mouvement, en mi bémol majeur, commence par un tutti merveilleusement écrit avec des doublures de cor à l’octave. La magnifique sonorité dissonante près de la cadence finale apporte à la belle conclusion une touche de pathos. Le rondo final a une sorte d’atmosphère alla Turca (ou alla hongroise), avec de vives inflexions rythmiques. L’énergie rythmique est contrebalancée par une tonalité plus sombre, car Dussek écrit dans le mode mineur d’un bout à l’autre, une entorse osée par rapport à ses précédents mouvements lents dans des tonalités mineures qui marque une autre innovation harmonique en ce nouveau siècle. Le concerto s’achève néanmoins sur une merveilleuse écriture pleine d’invention, avec des détours originaux et une très belle conclusion. In der Zeit um 1800 zehrten die Komponisten von Klavierkonzerten noch von den Beispielen Haydns und Mozarts. Jan Ladislav Dussek (1760-1812) schrieb in einem Zeitraum von dreißig Jahren beinahe zwanzig Konzerte. Zunächst spiegeln sie noch die Formmodelle der großen Vorbilder wider; spätere Werke allerdings beschreiten durchaus neue Wege und setzen andere Schwerpunkte. Diese zweite Folge mit Klavierkonzerten von Dussek bringt drei weitere Beispiele aus verschiedenen Schaffensperioden seiner Karriere: eines seiner frühesten Werke (op. 3 Es-Dur, veröffentlicht 1787), eines, das einige Jahre später entstand (op. 14 F-Dur, geschrieben um 1791) sowie sein einziges Klavierkonzert in einer Moll-Tonart (op. 49 g-Moll, veröffentlicht 1801). Dussek wurde im böhmischen Čáslav geboren (heute Tschechische Republik) und verließ seine Heimat noch im Jünglingsalter. Zuerst wandte er sich nach St. Petersburg und wurde danach Kapellmeister des litauischen Fürsten Radziwill. 1784 begann er ein Wanderleben als Klaviervirtuose und gelangte zwei Jahre später nach Paris, wo er sich bis 1789 aufhielt. Er floh vor der Französischen Revolution und verbrachte das anschließende Jahrzehnt in London, bevor er um die Jahrhundertwende in seine Heimat Böhmen zurückkehrte. 1804 wurde er Kapellmeister des preußischen Prinzen Louis Ferdinand; zwei Jahre später kehrte er nach Paris zurück, wo er bis zu seinem Tod 1812 blieb. Dusseks Klavierkonzerte, die gleichzeitig sein gesamtes Orchesterschaffen bilden, sind durchweg in der üblichen Dreisätzigkeit gehalten. Die Kopfsätze folgen der Form des Konzertsatzes mit doppelter Exposition, wie sie Ende des 18. Jahrhunderts durch Mozart zur Regele geworden war. Es folgt typischerweise ein lyrischer langsamer Satz, gewöhnlich in dreizeitigem Metrum und einer verwandten Tonart. Den Abschluss bildet ein Rondo in der Tonart des Kopfsatzes. Wie bei Virtuosenkonzerten üblich, steigern sich die technischen Anforderungen an den Solisten. Zu den auffälligsten Merkmalen der späten Konzerte Dusseks zählt der Umstand, dass eine Kadenz fehlt, die Mozart noch als wesentliches Element behandelt hatte. Schon früh hatte Dussek diese traditionelle Geste aufgegeben; zum letzten Mal sieht er sie im hier aufgenommenen Opus 14 von 1791 vor. Er scheint der erste Komponist von Bedeutung gewesen zu sein, der die Solokadenz aufgab; fast alle späteren Meister sollten ihm darin folgen. Sein Klavierkonzert Es-Dur, op. 3, heiter im Charakter, ist getreu dem zeitgenössischen Beispiel Mozarts von klassischer Formung. Nach dem Seitenthema folgt hier keine weitere harmonische Abschweifung, und durchweg wird das Material verwendet, das in der Exposition eingeführt wurde. Zu den fortschrittlicheren Elementen gehört dabei die unvermittelte, an Haydn erinnernde Rückung von G- nach As-Dur in der Durchführung, das Auslassen der ersten Themengruppe in der Reprise und das Fehlen der Solokadenz. Der zarte, im Dreiertakt gehaltene zweite Satz steht in der parallelen Molltonart; für Kontrast sorgen Unisono-Abschnitte von Klavier und Streichern, die an ähnliche Passagen in Mozarts d-Moll-Konzert, KV466, denken lassen, komponiert ein paar Jahren vor Dusseks Opus 3. Es folgt ein Kontrastabschnitt in C-Dur, schließlich die Rückkehr ins ursprüngliche Moll. Wie üblich macht ein lebhaftes, ganz nach Haydn klingendes Rondo den Abschluss, in dem Solist und Tutti die thematischen Bälle einander zuspielen und etliche Scheinreprisen in entfernten Tonarten unternehmen. Etwa vier Jahre später, um das Sterbejahr Mozarts 1791 herum, entstand das weiter ausgreifende Klavierkonzert F-Dur, op. 14; es zeugt von einer beachtlichen Entwicklung des Komponisten. Er folgt auch hier dem von Mozart eingeführten Modell, doch wirkt die Gesamtanlage selbstbewusster, und ihre formalen Nahtstellen treten weniger offen zutage als zuvor. Die Themen sind eigenständiger erfunden, und der harmonische Radius im Übergangsabschnitt des ersten Satzes zeugt ebenso von einem fortschrittlicheren Konzept wie die Einführung neuen Materials in der Durchführung. Diese neugewonnene Selbstsicherheit tritt auch in der größeren Anlage des Kopfsatzes in Erscheinung, der mit fast dreizehn Minuten nahezu eineinhalbmal so lang ist wie jener des Konzerts op. 3; Holz- und Blechbläser und Streicher werden mit neuer Meisterschaft konzertant eingesetzt. Im zweiten Tutti geht die Virtuosität eine Verbindung mit harmonischen Neuerungen ein, wenn die Sechzehntelpassagen des Klaviers in einen Triller auf der bisherigen Dominante münden und damit der Kadenz in die neue Tonart C-Dur den Boden bereiten (ähnlich dem entsprechenden Abschnitt im Konzert op. 3), bevor der gesamte Kadenzabschnitt wiederholt wird und damit Spannung und Erwartung noch wachsen lässt. Der zweite Satz des Opus 14 ist ein liebliches, pastorales Adagio in B-Dur mit dem besonderen Effekt, dass die Streicher das Klavier im Pizzicato begleiten. Zum Satzende spielt Howard Shelley eine eigene Solokadenz—die einzige, die auf diesem Album erklingt. Ein hochvirtuoses Rondo-Finale macht den Abschluss. Als sollte es eine ganz neue Art des Solokonzerts verkünden, weicht das Klavierkonzert g-Moll, op. 49, das erste, das Dussek im neu angebrochenen Jahrhundert schrieb, auffällig von seinen Vorgängerwerken ab. Im Druck erschien es als Opus 49—sowie, weil Dussek es mehreren Verlegern angeboten hatte, als Opus 50—im Jahr 1801, demselben Jahr, in dem Beethovens Klavierkonzerte Nr. 1, 2 und 3 entstanden. Als einziges seiner Konzerte steht es in einer Moll-Tonart und weist in Stimmung und Haltung stärker in die Romantik; wo die beiden anderen Konzerte dieses Albums leicht und heiter daherkommen, tönt es dunkel und ernst. Den zweiten Satz bildet ein Adagio in Es-Dur, den dritten das obligatorische Rondo, das wie der erste Satz in g-Moll steht. Der erste Satz des Opus 49 steckt voller formaler Neuerungen, besonders in der Behandlung der Themen. Das erste Ritornell verwendet sein Hauptthema auch für die zweite Themengruppe in der Paralleltonart und für die Schlussgruppe, die wieder in der Haupttonart steht, sowie für die Anfangsthematik des zweiten und dritten Ritornells. Drei ganz neue Themen—erstes, zweites und Schlussthema—führt dann der Solist ein, und alle drei erscheinen sie in der Reprise in der Haupttonart. Niemals übernimmt der Solist das erste Thema des Orchesters; das gleiche gilt umgekehrt. Darin geht Dussek über seine übliche Themenbehandlung hinaus, die für Solist und Orchester jeweils ein eigenes Haupt-, ein Übergangs- und ein Schlussthema vorsieht, während das Seitenthema beiden gemeinsam ist. Im g-Moll-Konzert scheint Dussek dem Solisten eine ganz eigene Themensphäre vorzubehalten, die weit von jener des Orchesters entfernt ist. Die Durchführung enthält, auch darin anders als sämtliche anderen Konzerte Dusseks, ausführliche harmonische Sequenzmuster. Hier scheinen seine romantischen Nachfolger—Mendelssohn, Chopin, Schumann, Wieck, Liszt und andere—aufgemerkt zu haben, denn ihre später entstandenen Konzerte sollten etliche dieser Eigenheiten aufgreifen. Der herrliche zweite Satz steht in Es-Dur und hebt mit einem exquisit instrumentierten Tutti an, unter anderem mit Verdopplungen in den Hörnern. Die fantastisch dissonanten Klänge der Schlusskadenz verleihen dem Satzende eine pathetische Färbung. Dem Schlussrondo eignet mit seiner übermütigen, rhythmischen Melodik ein Hauch von alla Turca (oder auch alla Hongroise). Diesem rhythmischen Drängen steht der dunklere Mollcharakter entgegen, den Dussek hier durchgehend beibehält—auch dies in Abweichung von seinen langsamen Sätzen in Molltonarten, eine weitere, gewagte Neuerung, die sich ins neue Jahrhundert hinein auswirken sollte. Dabei bildet der Satz mit seiner prachtvollen, einfallsreichen Instrumentation und seinen launischen Abwegen einen äußerst wirkungsvollen Abschluss.